Twenty two words can’t say much. But twenty two words can also say more than enough. 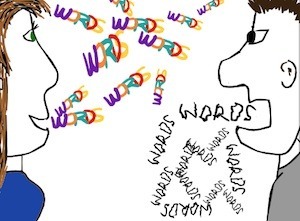 Their meaning really depends on which words, who’s saying them, and how they’re spoken. I’ve been around people who could use one foul word in twenty two ways…all of which were just as foul and ridiculous as the first. And I’ve also been around a few people who could take twenty two words and turn them into a most comforting message in a greeting card, or bedside talk with a child, or final words for a dearly departed loved one. As for me…I love wordplay. And playing with words and their rhythms and syllables. I don’t always have a secret reason for my rhymes, but most times I do. So, I wonder if you can find the two secrets behind the short rhyme I’m writing for kids today. If you can, please be sure and leave me a comment below and tell me your guess. The one with the right answer (or at least the closest to the right answer) will get their very own a short rhyme. Just about to fade away. I made this word bouquet.